Living in a healthy, sustainable and holistic manner is something everyone should aspire to. However, putting this ideal into practice is often challenging, especially when you have an entire family to consider. This doesn’t mean it’s impossible though – far from it. There are several strategies that help make this lifestyle more accessible to anyone listed below. With a few simple changes to day-to-day routines, healthy, holistic living really is in reach. A sustainable lifestyle, a clean conscience, and a healthier home are goals to be proud of. Today, those goals are going to get a little closer to reality for your family. What Does Healthy Holistic Living Mean? First of all, there are health challenges faced in every corner of the modern world. For instance, many people consider the food they eat an important part of healthy living (which it is). They understand that the fuel they put in their body plays an important part in determining their health, but not the myriad of other factors in their homes and daily lives that can affect the health of their families. 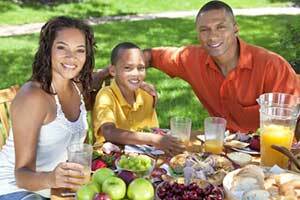 Can all influence how healthy and holistically a family is living. When a family starts learning how to incorporate these practices in their daily lives, it can lead to increased levels of health and happiness in the home. With the tips below, hopefully anyone can find at least one way to start making the shift to a healthier lifestyle for their family today. Healthy holistic living starts with nutrition. Everything a person puts in their body has the power to heal or the power to hurt. 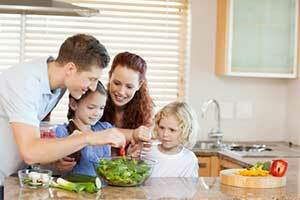 This makes the decisions about what a family eats on a daily basis incredibly important. Eating organically is a wonderful place to start making the shift to healthier living. Everything we eat, be it meat, fruits, vegetables or grains can be found in organic form, and there are good reasons to consider making the switch. Fruit and Vegetables: One of the best reasons to switch to organic fruits and vegetables is to get away from the use of organophosphate pesticides. These chemicals are sprayed extensively on the foods that most people eat, and although the United States has regulations limiting how much and in what ways these chemicals can be applied, there is strong evidence that more than enough chemical to cause harm remains on these food products. Meat: When it comes to meat, the hormones and antibiotics treatments given to most non-organically raised animals should be cause for concern. Organic meat is free from these substances. Organic meat is also feed a diet of natural, non GMO foods. It is important to remember that when a person eats meat, they are also going to ingest all the chemicals and biomolecules that the meat source has absorbed over the course of its normal diet. That makes the feeding or organic feed to organic meat sources particularly important. Grains: When it comes to incorporating grain into your diet, whole grains are a much healthier choice than any refined grain products. The problem with conventionally raised whole-grain products though, is that any chemical sprayed on the product has a chance to remain on the outer shell, whereas it may be removed during the processing stages that refined grains go through. When opting for whole grains, the shift to organic is doubly important. Next, consider the products that are typically used to clean the home. These are a variety of harsh chemicals which supposedly make excellent cleaning products. However, the thought that these products are being used in the home does not sit well with many people. They are lying on almost every surface and permeate the air breathed by the family. Instead, consider cleaning products made from all-natural sources. There are any number of natural ingredients which can be used to create powerful and effective, even antibacterial cleaning agents, without resorting to harsh chemicals that are hard on the body. 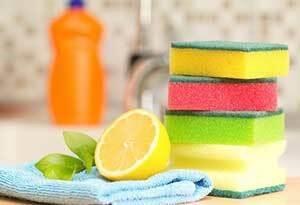 For instance, common household substances such as vinegar and lemon can be used to make very effective antibacterial cleaning agents. Healthy cleaning products aren’t just restricted to those used in house cleaning. Personal hygiene products such as hand soap, body wash and shampoo can also be found in organic, all-natural variations. These are considered by some to be even more important than the household cleaners, because these products are actually coming into skin contact with users on a regular basis. Laundry detergent is another product that many people buy without thinking. Many detergents however are harshly chemical, and can cause skin reactions or allergic reactions ranging all the way to breathing difficulties with certain highly sensitive people. Switching to a natural detergent helps greatly reduce the likelihood of an adverse reaction. It also is much better for the environment, as the by-products of laundry day using regular detergent can be quite harmful for the environment. Take a look at the materials listed on clothing tags belonging to your family. Chances are, that clothing is going to be made, at least in part, from a handful of synthetic materials. Most likely it was dyed using harsh chemical dyes as well. Shopping from sustainable clothing producers who use natural materials provides a healthier alternative while also supporting local craftspeople who produce the clothing. Even dishware can be sourced from healthy organic sources. This is important when traditional manufacturing techniques for these products are considered, especially those which incorporate a great deal of petroleum-based products. For more information about eco-friendly dining ware, check out our online shop – complete with BPA-free bento boxes, compartment plates, sippy cups, and more!